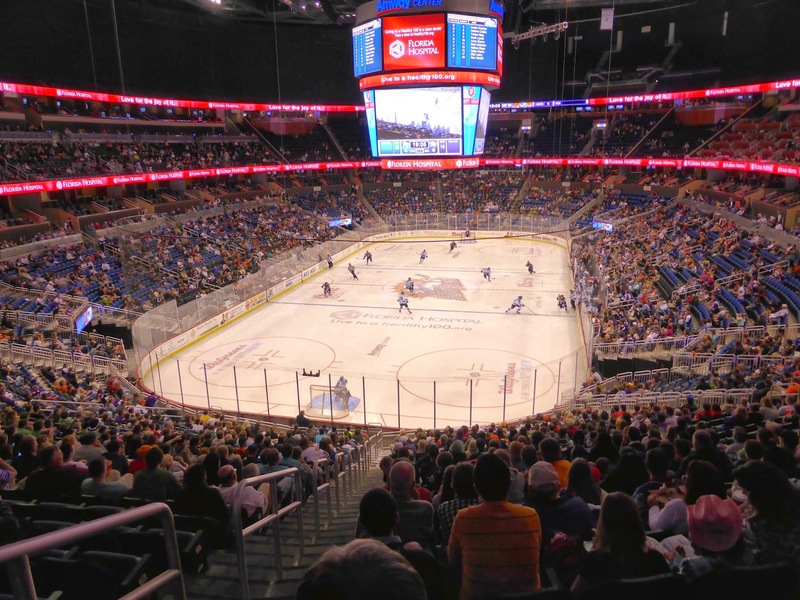 Casual hockey fans might think that Florida has but two pro hockey clubs, the Lightning of Tampa Bay and the Florida Panthers. Actually though, there are a few other teams that skate in the Sunshine State: the Florida Everblades and Orlando Solar Bears of the ECHL and the Pensacola Ice Flyers in the SPHL. I've seen a game in Estero where the Everblades play and stopped in Pensacola during my NFL Road Trip, leaving just Orlando. 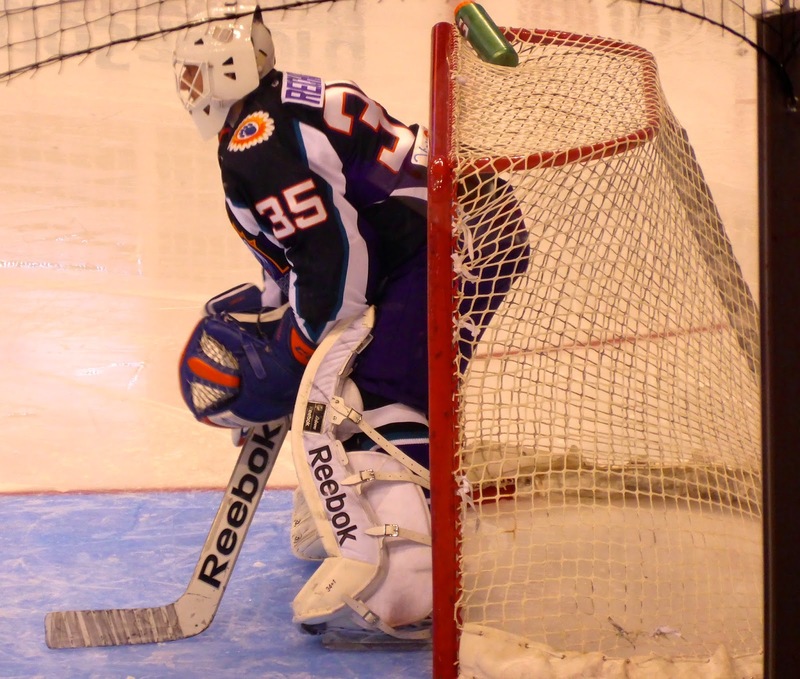 The Solar Bears are a relatively new team, having begun play in 2011 and taking the name of the IHL team that folded in 2001 along with the league. 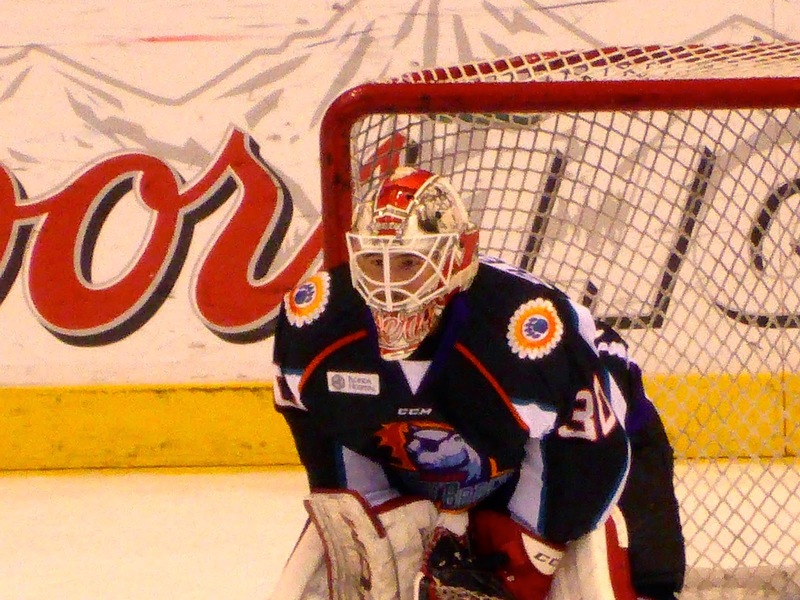 In 2013, the Solar Bears started an affiliation with the Maple Leafs, who join the Iowa Wild as the NHL clubs supplying players to Orlando. 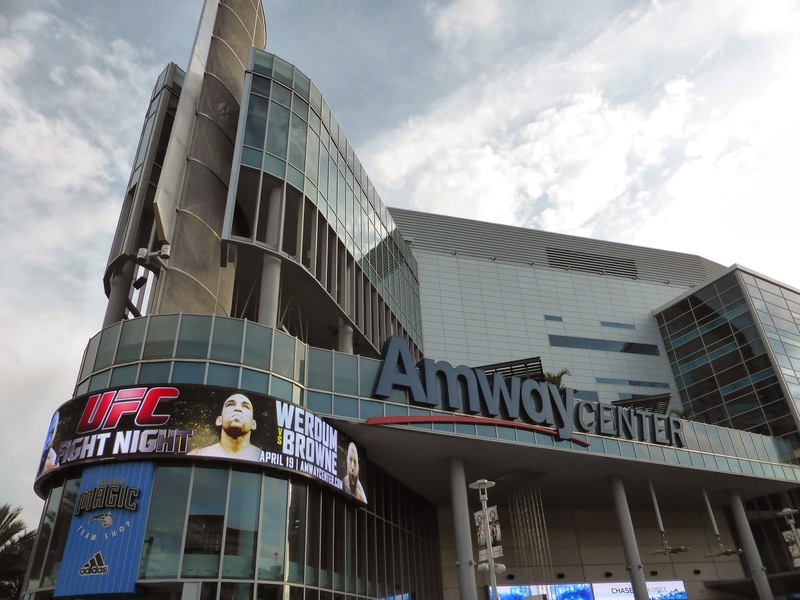 The team plays in the Amway Center, also a new addition to the community, opened in 2010 to replace the outdated Amway Arena. 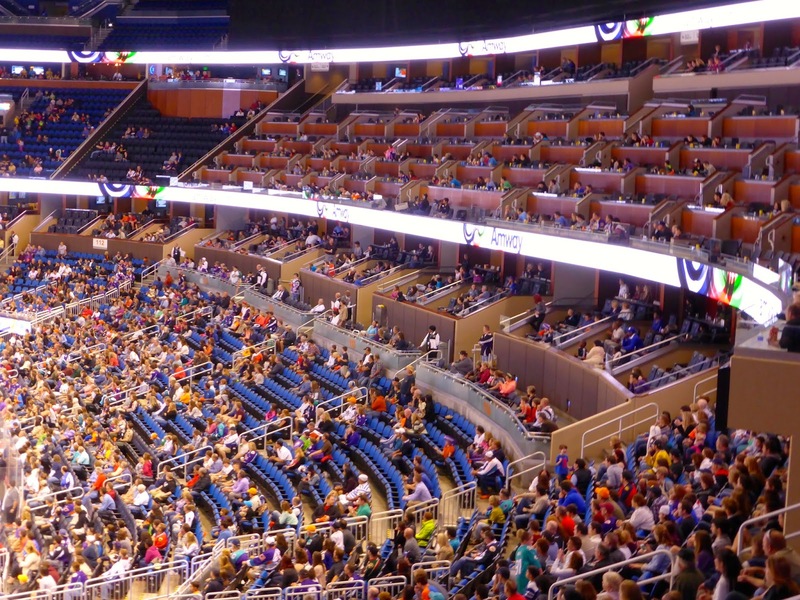 Although the Orlando Magic are the primary tenants, the arena was designed with hockey in mind as well, allowing the Solar Bears to be formed. The upper bowl is closed off for hockey, but the club seats are open and on one side, they look pretty cool, resembling a press box with tables as you can see in the upper portion of the picture above. Known as the Loge Boxes, they seem like a good deal at at $42, given that the cheapest box office ticket is $16. 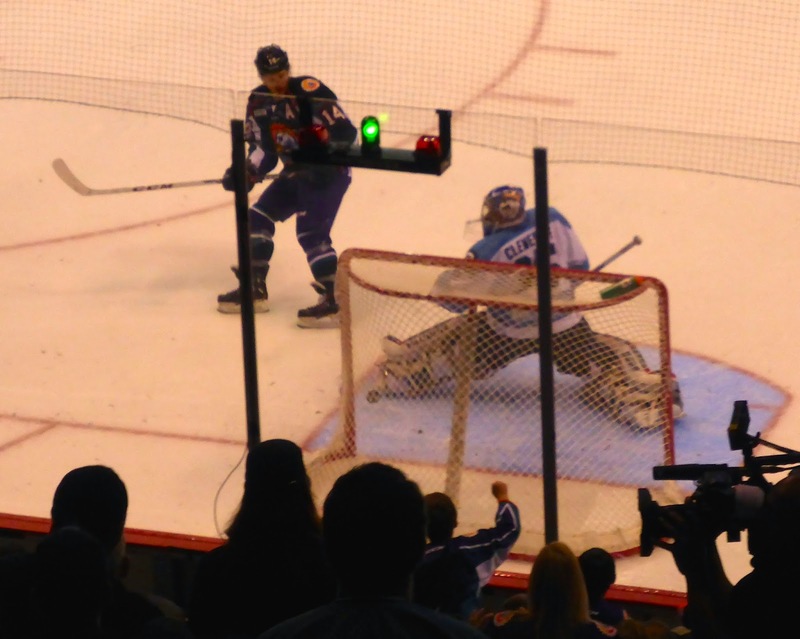 There is also a standing area behind one of the nets that offers a good view of the whole ice surface (above). I spent the third period here after sitting low in the corner for the first two. Concessions here can be overpriced as they use the same pricing structure as the Magic, but $4 for a pretzel seems fair. As I'm coming back for basketball, I didn't spend much time touring the facility, but it works very well for hockey. Given that the Florida Gators were playing in the Elite 8 at the same time, you would expect a sparse crowd but there are a lot of sports fans who haven't been seduced by the hype of March Madness and they were rewarded with a very entertaining game. 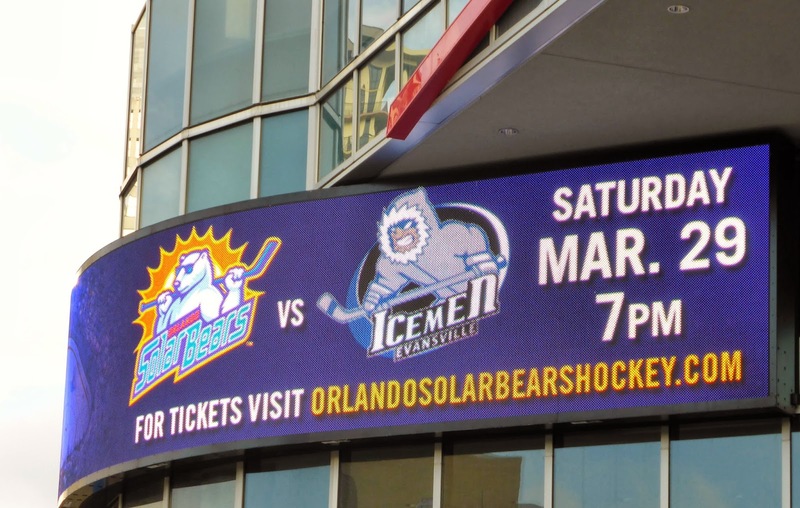 The Evansville IceMen cameth into Orlando for a 2-game series. 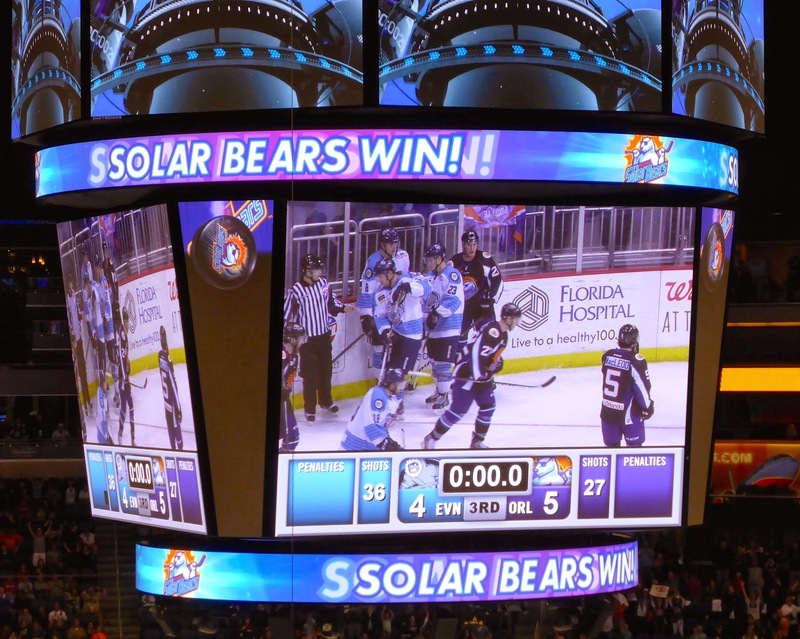 The division-leading Solar Bears won the first match on Thursday and wanted the sweep to all but clinch a playoff spot. Evansville is out of the playoff race but not eliminated yet. Cody Reichard (below), who made SportsCenter's top 10 plays last month, started for Orlando against Mike Clemente. Early on, league-leading scorer Mickey Lang had a breakaway for Orlando, only for the puck to be tapped off his stick by a diving defenseman. Lang fell over the d-man as the puck skittered away and the referee awarded a penalty shot, which was not correct according to rule 57.3, as Lang had lost control. 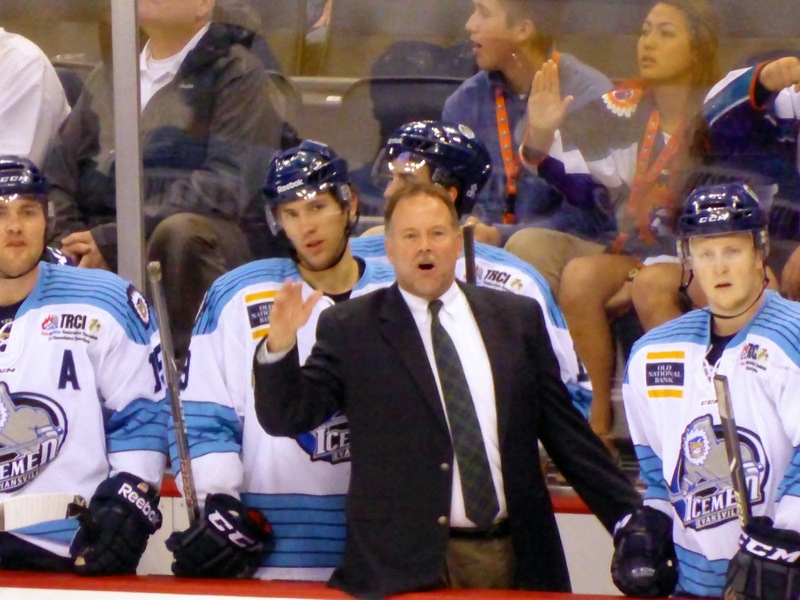 IceMen coach Jeff Pyle strenuously disagreed with the call (below) but the ref couldn't change his mind and Lang took his penalty shot, only to have it saved by Clemente. 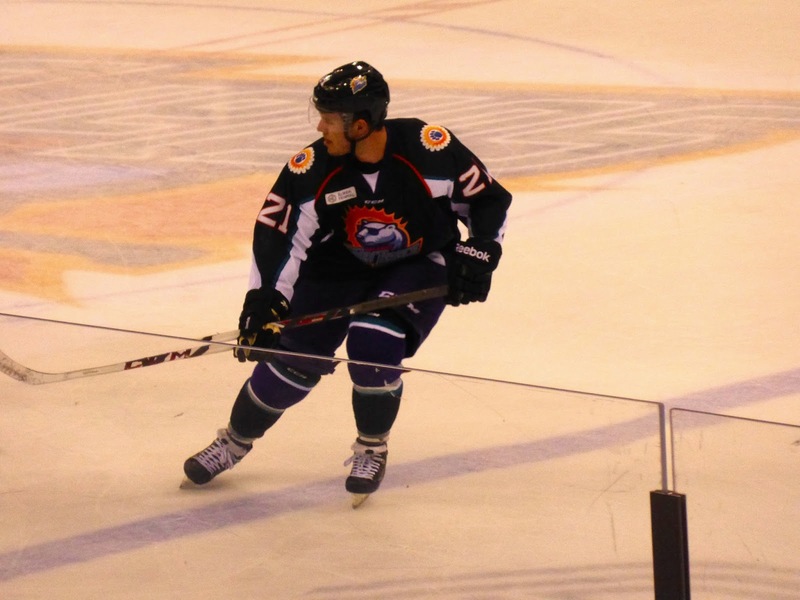 Midway through the period, Connor Goggin (below) opened the scoring for Orlando, beating Clemente with a hard shot from the point. Evansville tied the game on a power play and that is how the first period ended. The second period saw the teams trade early goals, with Goggin scoring his second to tie the game at 2 just 1:17 in. Then Reichard let a softie from Daultan Leveille beat him over the shoulder and when Kellan Tochkin banged home a rebound just 41 seconds later, Reichard was done for the evening. He was replaced by Maxime Clermont (below), who played junior for Gatineau, where I saw him play in 2010. That seemed to spark the Solar Bears, who scored two quick ones from Taylor Matson and Jacob Cepis and send us to the final frame knotted at 4. With just seven minutes to go in the game, Cepis took a pass from Lang, skated in, and beat Clemente with a perfect slap shot to send the crowd of 8,458 into a frenzy. Later on, Ian Slater had an empty net after skating around Clemente, who threw his stick to break up the play. 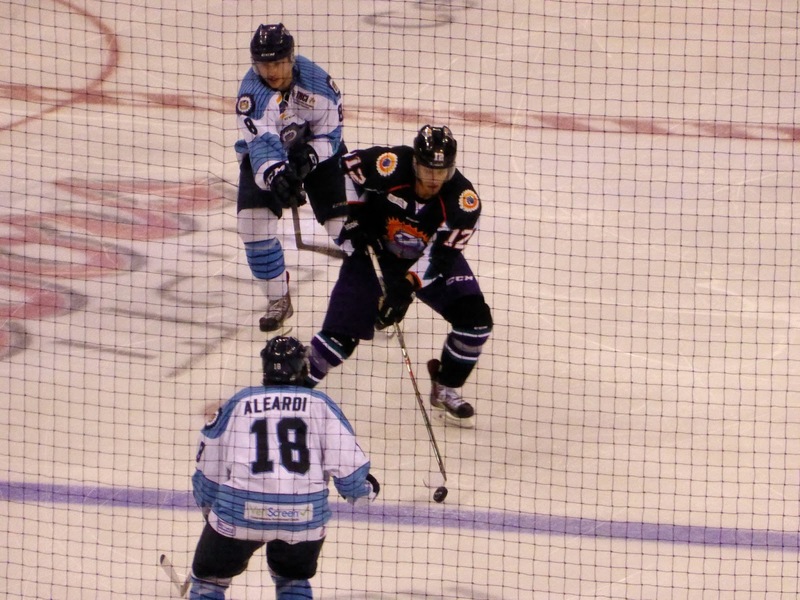 Yep, another penalty shot, this time Slater missed wide (below) to keep the IceMen in the game. They tried furiously to tie, but Clermont was equal to the task and Orlando won 5-4. With the Maple Leafs historic eight-game slide from second place to tenth, I'll take this as small consolation: at least one affiliated Toronto hockey team won today. 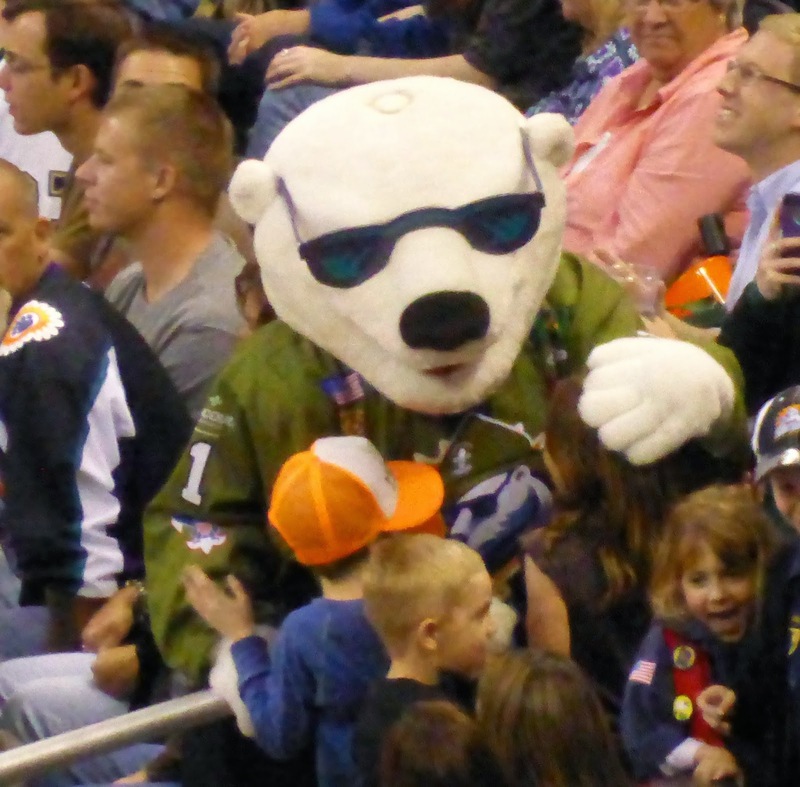 Speaking of the Leafs, Carlton seems to have been used as inspiration for Shades, the Solar Bears mascot. There was a charity game played earlier in the afternoon with former players Allan Bester, Dave Christian, Mike Ramsey and Marcel Dionne on hand. 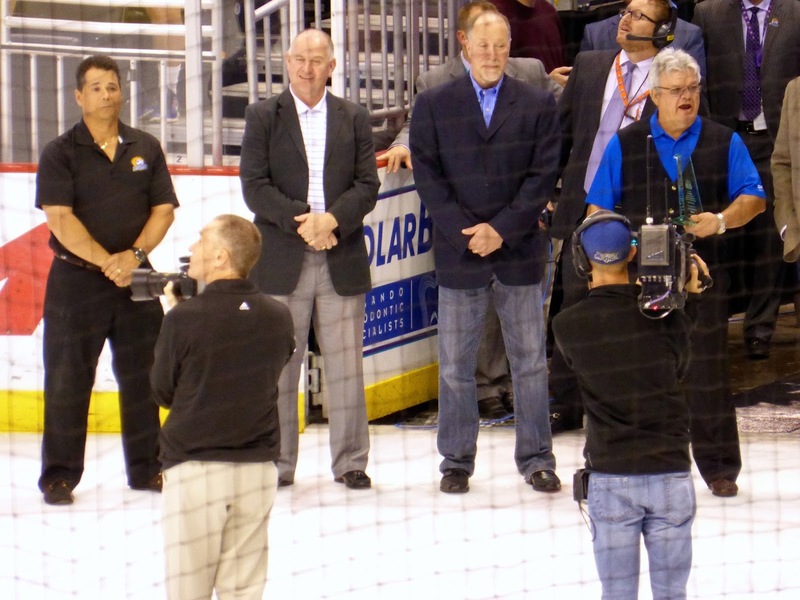 They were on the ice during the first intermission for an award presentation and signed autographs during the second. Bester finished his career in Orlando back in the mid-1990s after being run out of Toronto, much like what is happening to James Reimer now. The fans behind me were obsessed with shots on goal. In particular, they felt that anytime the goalie touched the puck, it should be a shot (not true) and when the "shot" was not added to the total, they felt the stats guy wasn't doing his job. I wanted to turn around and explain to them the criteria for a shot on goal, but held my tongue. Nobody likes snotty Canadians explaining the intricacies of hockey. Safe to say there is no conspiracy in Orlando to hold down the home team shot total. The Raptors are in Orlando tonight and I'm heading back to enter Club 122. That means I will have seen a game in all 122 active venues of the Big 4 sports! Check back tomorrow for a recap of that.